Looking for a fresh take on your iPhone? For a short time, Gizmodo readers can get Spigen's super popular all-glass screen protector (GLAS.t) with their tough armor case for $39. 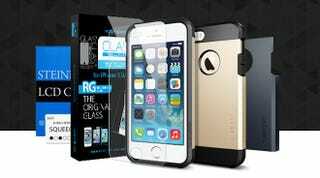 Good for iPhone 5 & 5S, this is a bargain on one of the best iPhone cases around. Finally getting an iPhone 5S or want a new case? Spigen's Tough Armor case is straight from CNET's 2013 Holiday Gift Guide, and iPhone in Canada called it "the best one [case] in the market." Tough Armor Case and Interchangeable Frames – The bundle comes with both colors, you choose which to rock. GLAS.t Slims – built of ultra thin, anti-shatter glass. Normally this bundle would add up to $80, but Gizmodo readers can get them for $39 - 50% off. P.S. I'm here to help! So if you have any questions, comment below and I'll answer ASAP.